You can divide a storyboard into several parts. Each export portion of the storyboard will be saved as a different file. You can choose to save an intact copy of the entire storyboard or divide the project into separate files. From the Scenes section, select a scene or press Shift+click to include more than one scene. NOTE: The number of panels in a scene is indicated under the Panels heading. These panels cannot be divided, and you cannot split a scene. Choose a name and location for this new project file and click Save. The project name and location appears under the Path heading in the Projects section. To delete an extracted project, select it from the Projects section, and click Remove Selected Projects. 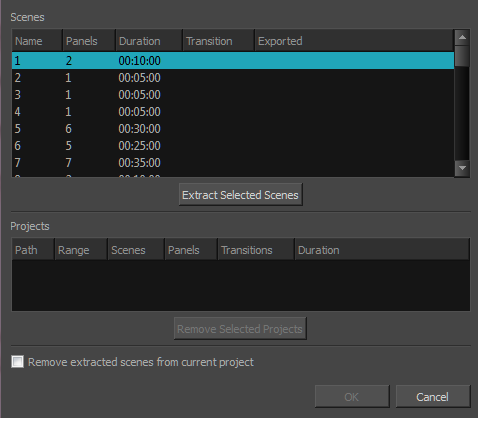 Select the Remove extracted scenes from current project option. This option determines if you will have an intact copy of the entire storyboard.